A new partnership between Friedman Memorial Airport and the Senior Connection is providing snacks for outbound passengers while raising money to help fund programs for local seniors. On Tuesday, the Senior Connection began operating a snack counter at the airport, which had been without food service for the past few months. The offerings include fruit, yogurt, bagels, sandwiches and drinks. The counter is open from 5:30 a.m. to 1 p.m. Its early-morning opening serves passengers on Delta, United and Alaska Air flights that depart during the airport’s new morning rush hour. Senior Connection Executive Director Kimberly Coonis said the snack bar has been serving about 150 people per day. “I can tell you there were a lot of smiles this morning,” airport Manager Rick Baird told the Airport Authority board during a meeting Tuesday night. “This gives us a lot of visibility and enables us to get the word out,” she said. Coonis said profits from the snack sales will help fund the nonprofit organization’s programs, which include Meals on Wheels, daily lunch served at its facility in Hailey, in-home care and educational and exercise classes. 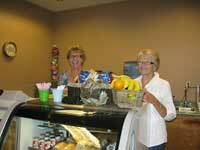 She said the snack bar is currently staffed by a paid employee on weekdays and by two senior volunteers on weekends. She said she expects to get more volunteers involved. She said that if the program proves successful, operations may be expanded to include beer and wine sales in the afternoons. Coonis said she hopes the snack bar will remain in operation once an expanded and renovated terminal opens next year. Construction is scheduled to begin this fall and extend into the spring. It is part of a larger project intended to bring the airport into line with federal safety standards for ground operations of aircraft. The food service is being conducted under a 90-day trial period, during which the airport is not charging the Senior Connection for use of the space. Coonis said it has not been determined whether there will be a charge once the trial period ends. “I’m hoping that they’ll keep their generous little hearts open forever,” she said.